Santa Barbara has some of the most beautiful beaches on the California coast. We recommend enjoying them fully whether kayaking the coastline, surfing the waves, or just building a sand castle with the kids. Here are some tips on local beaches and a map to help find them. Parking fees: Almost all of these beaches have some type of parking fee. There is open parking at Summerland’s Lookout Park. There are a few 90 minute parking spots at Leadbetter Beach and some street parking available at East Beach. Santa Barbara’s parking fees are generally very reasonable. Camping: You can make camping reservations for the 3 state park beach areas. They are Carpentaria State Park, El Capitan State Park and Refugio State Park. Make reservation early for the summer months or you might be disappointed. Kayaking and Surfing: Santa Barbara Adventure Company offers guided kayaking tours and surfing lessons at several of these beaches including Refugio State Beach, West Beach, East Beach and Santa Claus Lane. 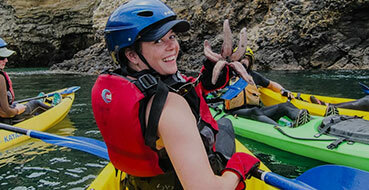 You can rent kayaks on the weekends at the Adventure Company Rental Site on East Beach. Call to ensure the site will be open if you are planning a group event. Finding some of Santa Barbara’s favorite beaches can be tricky, especially if you don’t know your way around town. Here is a map to help you plan your route. Where is your favorite beach? Please share your insights, tips and reviews. We appreciate your feedback!